I love that she even copied the bow between the words. I'm not sure if she knows it's a bow. She might've been thinking, "What kind of letter is that?!" She's such a sweet sister. We had Rachel open the presents progressively, as we skyped with the grandparents who provided them, which just about killed her. I didn't get many pictures during the present opening because the chaos of our children skyping combined with the excitement (and contention) having new playthings brought to our household meant that I was doing a lot of refereeing. Are our children the only children in the world who go a little crazy in front of a camera? They turn into wild maniacs whenever we try to skype our families—bouncing off the walls, screaming, fighting, showing off. She had a hard time taking a break from opening presents so that she could go grocery shopping with Daddy. I don't like having sugary cereal in the house but the girls always ask for it, so we adopted a tradition from one of my high school friend's family and we allow the girls to choose a pick a box of cereal for their birthday. Rachel chose Trix. And they did the rest of the grocery shopping, too, while I stayed home with Benjamin and cleaned the house. He's a surprisingly good baby when his sisters aren't around to either bother him or leave him out of their games. Usually he's either screeching at his sisters because they're teasing him or else he's banging on their bedroom door, begging them to let him in while they're locked away playing with verboten "choking hazard" toys. This afternoon he wandered around the house playing with whatever he wanted and not following me around, crying at my heels about all the injustice in the world. He folds in half, rests his head on the floor, and cries. Sometimes he'll flop right onto his stomach. It's terribly cute...for now. Rachel somehow convinced Andrew to buy her a birthday watermelon! I should send her to the store with Andrew more often. He hates watermelon. But apparently he'll buy it for Rachel. All three kids were so excited for watermelon (which means we might be getting more of it, despite Andrew's opinion of it). Benjamin was a super fan. We also had pizza and homemade butterbeer! Andrew found this recipe and had to try it and since Rachel's such a Harry Potter fan he thought it would be the perfect beverage to accompany her birthday dinner. Miriam would not touch the stuff. "I only like butterbeer in Florida," she explained. "So I can't drink it in North Carolina, unless it's my birthday and then I can drink it because my birthday is on Halloween, which is a Harry Potter thing." We were all so stuffed after dinner that we had to take a break before having cake. We opened some more presents and then watched The Princess and the Frog (because Grandma had given Rachel a that play set) while we digested. My birthday is in July. I have 1 brother and 1 sister. We have a small family. I was born in Orem, Utah. My sister was born in Cairo. My brother was born in Utah. That's as far as she got in her autobiography. She's very interested in continuing her life story. Rachel was very excited when it was finally time for cake. I made it yesterday while she was at school since she asked if it could be a surprise. She came home just before I put the words on her cake, so I met her at the door with an icing bag full of pink frosting. "You wanted a pink unicorn cake, right?" I asked her. "Because pink is your favourite colour." "No!" she gasped. "I wanted a blue Magic Treehouse cake! Blue is my favourite colour!" "Oh, oops," I said. "Oh, well. I guess you just get what you get and don't throw a fit!" She acted pleasantly surprised when I brought it out this evening, though I have a hunch she sneaked a peek in the refrigerator this morning. The main inspiration for this cake came from here, though instead of using popsicle sticks I made the treehouse out of graham crackers. Rachel helped me peruse inspiration cakes and she liked this one a lot, though she requested that the treehouse be edible. I figured if graham crackers can be used to create houses in December they can also be used to create treehouses in July. 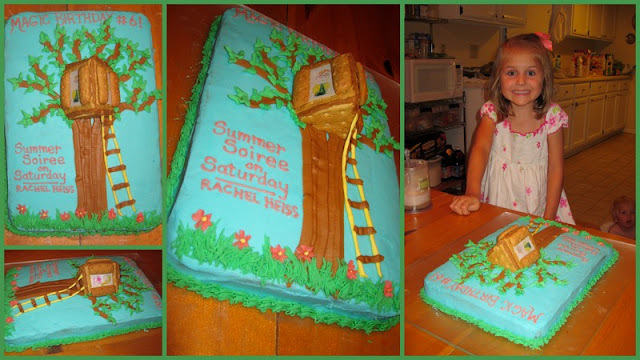 I tried to make the words on her cake match the Magic Treehouse series' titles. It took me quite a long time to settle on Summer Soiree on Saturday. It was Andrew's idea to put Magic Birthday #6 at the top, which also follows suit with the front cover layout of the series. Our printer is out of toner so I drew pictures of Jack and Annie (Miriam coloured them) and put them "in" the treehouse. Jack turned out a lot better looking than Annie (or Ay-nee, as Rachel calls her). I saved some leftover fondant from making Benjamin's cake last month just in case I needed it for Rachel's cake and though I tried to go 100% buttercream, I did break out the fondant for the ropes of the ladder and the centers of the flowers (mostly because I had already dyed all my icing and didn't want to make another batch but needed another colour; it also made for a sturdier rope, which mean that it could swing off the treehouse instead of being flat on the cake). Rachel wanted to reuse the star candles from my birthday cake last month (summer is a busy time for us!) and put them in the tree so that it would look like the treehouse was in outer space. She very nearly started blowing out the candles before we started singing to her, but we stopped her just in the nick of time. She felt pretty silly. ...before blowing out the candles one by one. As soon as she'd finished blowing the candles out, she began plucking them off the cake and sucking the icing off. She's lucky she didn't burn herself; she hardly waited two seconds! The problem with birthday cake, at least for our family, is that we can never finish an entire cake. We forgot to invite anyone over to help us eat the darn thing, so when I'd finished my piece I chatted to Addi (Diego's mom) to see if their family could use some cake (because I'm pretty sure that when your child has cancer you always need cake). Turns out, her sister is there helping out and it just happens to be her sister's birthday today and they were just talking about how they hadn't gotten a cake for her when I asked them if they wanted some of ours. I love it when things like that happen! "Is Diego home?" Rachel asked. "He is," I said. He's recovering from having his kidney and a three-pound(!) tumor removed before starting chemotherapy. "Then let's go!" she cheered, abandoning her cake. Diego's grandparents are there, too, so we took over about half the cake. Hopefully we'll manage to finish the half we have left. She's a joy to have in our home! I'm so glad she's ours! Happy, happy birthday Rachel!!! I hope you enjoy being 6! Stopped throwing terrible tantrums ;). That made me laugh! Happy birthday Rachel! Seriously though. Her tantrums this year were mild compared to how they've been in the past. Whereas she used to scream for hours at a time, she managed to whittle it down to only about a half hour for her worst fits. It has been FABULOUS. Wow, she is fast. My last terrible tantrum was at age 15. I still remember it, and am embarrassed by the memory. I am glad Rachel is a faster learner! That cake is super cute. I'm jealous of your decorating skills. Happy birthday! You guys have done such a great job raising this girl. And what a cake! Wow! I loved reading about your visit to the planetarium. Your writing is so engaging.